Mark Rylance is often described as the greatest stage actor of his generation, a breathtaking interpreter of Shakespeare, the classics and new plays. The 56-year-old's work on film and TV has, perhaps, made fewer headlines, that is until the past year. First there was the BAFTA for Wolf Hall; then there was the Oscar for Spielberg's Bridge of Spies; and this summer saw the blockbuster success of Spielberg's adaptation of The BFG. 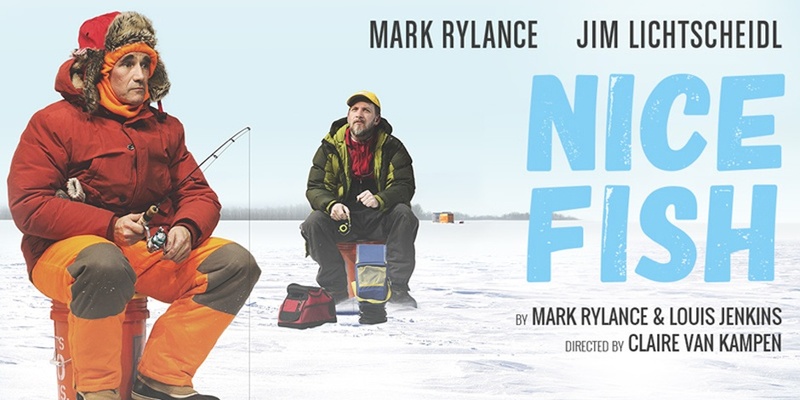 When I speak to Rylance on the eve of the West End premiere of his new comic play Nice Fish (which he has adapted from the works of the critically acclaimed Minnesotan prose poet Louis Jenkins), he remains down to earth about the whole fame thing. No, he says, the awards haven't changed how he has to live his life. Yes, more people recognise him, "But," he laughs, "they're all nice people; the people who don't like you won't stop you." His filming commitments haven't kept him away from the stage. Last autumn he was at the Duke of York's Theatre in Farinelli and the King, written by his wife Claire van Kampen, and now he and van Kampen are working together again, she taking the reins as director of Nice Fish. You could describe the play as Waiting for Godot on ice. Two old school friends, Ron (Rylance) and Erik (Jim Lichtscheidl), meet up after many years to go ice-fishing on a frozen lake in Minnesota. Erik is the serious fisherman; Ron is just along for the ride, a loopy, but engaging fool, who causes chaos while trying to kill some time. "There's a lot of me in Ron," says Rylance. "I have quite a wild imagination, sometimes incomprehensible imagination to some people. I'm very enamoured of mystery and things that are beyond the kind of fence of rational orthodoxy or accepted thinking." Rylance grew up in the American mid-West. He didn't go ice fishing as a child, but did try it out when he was performing in Peer Gynt at the Guthrie Theatre in Minneapolis in 2007. "It's a mystery to me why men - it's mostly men - do this. Why do they build themselves shacks out there? Are they running away from something on solid ground? What do they need that they go out there on the ice?" Rylance has worked with his wife many times over his career. Who holds the balance of power now when it comes to creative decisions? "Nowadays she wins. I'd say it's been a gradual change over the years: the best way we'd describe it would be to say that she's the master chef and I'm the sous chef." Has he been equally happy to play sous-chef to Spielberg? "Yes," says Rylance. "Film directors need to be very ordered and deliver things on time and on budget. So what they can't indulge themselves in is chaos. I think they like people who are able to bring chaos to them, as much as the formal gardener is very appreciative of compost. With Spielberg I'm the compost and he's the gardener." Has anyone in Hollywood ever asked him why he's still doing plays when he can make much more money in film? "I remember my son-in-law worked with Harrison Ford and Harrison said at one point, "Oh, theatre's for poor actors.' Actually, I think sometimes there's a heightened respect for film actors that is more than we deserve really. I think for people who have only done film it seems a little frightening to them. So I don't think that there's so much of that attitude of why's he going back to theatre now that he's been offered lots of films and won the award. I think it's more that I get too much respect for being a theatre actor." Still, Rylance does suffer for his art in Nice Fish. He and Lichtscheidl perform the whole play in full ice-fishing kit. It gets so hot they have to fill their pockets with ice packs to cool them down. In a moment of Rylancian battiness he suggested to the producer Sonia Friedman that free tickets to one of the Harold Pinter Theatre's boxes should be given away to spectators dressed as fishermen - or fish. "I think it was my mistake to add fish as well as fishermen. I was initially just thinking of people fishing out of the boxes!" Leicester Square will be packed with people sleeping rough overnight in fish costumes, I tell him. "Oh, don't say that, it's only a few seats," he says, sounding slightly desperate. "We might have to have a special only fish performance." Perhaps it will become like the The Rocky Horror Show with fins. "If it became like the The Rocky Horror Show, I'd be very happy with that," he says. Nice Fish is playing at the Harold Pinter Theatre from 15th November 2016 until 11th February 2017. Click here to book your tickets now from the official Box Office.